and it arrived and worked perfectly. My bottle is almost finished so I ordered two more only to find out that Aramex labeled the shipment as 'unacceptable' and will refuse to ship, because they don't ship liquids, they said it must've been a mistake when they shipped my first bottle. I looked everywhere for insecticidal Neem Oil available where I live, and I found nothing. My only bet is maybe finding natural neem oil (maybe not sold for insecticidal purposes) in herbal medicine shops. 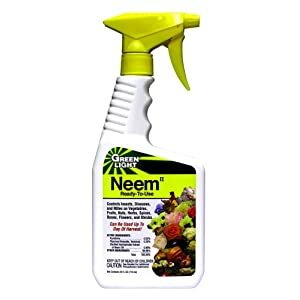 Will neem oil sold for medicinal purposes work if sprayed on insects? will it still do what the bottle I had did? (working as a fungicide, a miticide, and an insecticide). I don't know about the fungicide part, but for mites and insects, you can spray almost any oil, including cooking oil. It works by clogging up their breathing pores and any oil will do that, if sprayed directly on the insects/ mites. RG is 100% correct. Any oil will kill insects. If you're looking for an oil with antifungal properties, you might consider cold-pressed coconut oil. Where I live, coconut oil is far too expensive to use for plants ... for me, anyway ... but it might be less expensive in your area.